If the most enduring proposition in the history of Canadian art has been the landscape – it is perhaps because it has proven to be an exceedingly adaptable subject matter. Continually reinvented over several centuries to suit the shifting interests of Canadian artists, it has accommodated diverse poetic, philosophic, aesthetic and political interests. While the representation is apparently elastic, one of its strongest resonances is still as a metaphoric embodiment of the ultimately interior ”nature” of subjectivity. The iconographic model of such a relationship is provided by the paintings of the Group of Seven. To their urban Canadian audience, such images both figuratively and literally represented the country’s resources – which while remote and invisible were formidable, providing the basis of enduring national values. The landscape came to be understood both as an expression of rugged individualism – and collective social identity. These images were meant to convey a specifically Canadian landscape; sublime and unaffected by technology, mythically pure, uninhabited and inherently uninhabitable. 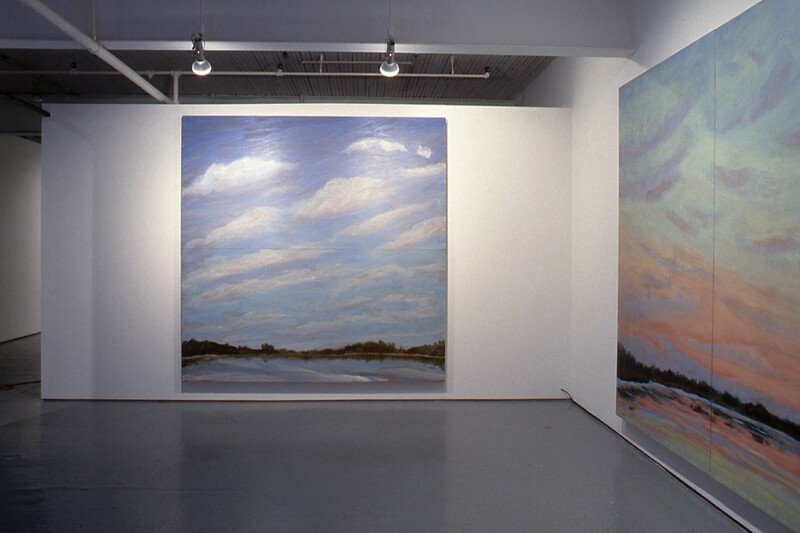 Sixty years later, in Rae Johnson’s paintings (1988-89) and Tom Dean’s video Fear of Blue(1982) the image of the landscape has been transformed – and while it is still employed as a reflection and embodiment of the psyche, it has been emptied of both nationalistic sentiments and appeals to the sublime. Both these works take a passive approach to nature, seemingly content to observe and record it accurately. Though, through scale or duration, they attempt to reproduce its immensity, unlike many of their -predecessors they do not seek to convey the landscape as infinite or inviolate. Rather, they allude to the concept of nature in terms of a reciprocal relationship to culture. In 1988 Johnson abandoned the figurative, often sexually explicit, tableaux that formed the basis of her earlier work. 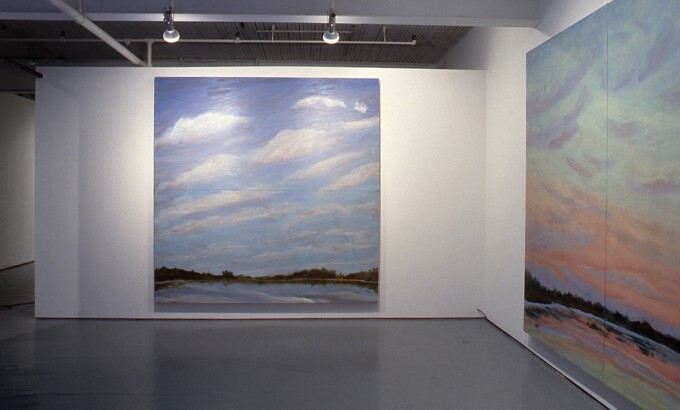 Concurrent with a move away from Toronto, she began a series of plein air sketches that detail the effects of light and wind on the pond at her home in Flesherton, Ontario. The many sketches and the observations that they recorded were later reworked or remembered in the production of her large scale studio paintings. 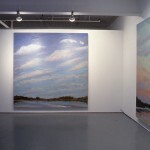 In both Green Sky and Hazy Sky, clouded expanses, continuous with the water in which they are mirrored, dominate the surface of the painting. Only a narrow strip of land, a band which cuts across the lower portion of the painting, separates the two. The airiness and intangibility of this image is emphasized by the physical structure of the paintings. On large wooden panels which resemble theater flats, loosely painted in layers so thin that the grain and colour of the wood appears through the brush strokes, Johnson emphatically recalls the high-keyed colours of Tom Thompson, but not his sumptuous surfaces. In this way she presents an image that communicates an ephemeral interior experience of nature rather than the sense of tangible materiality characteristic of the Group of Seven’s objectifying depictions. The paintings’ mnemonic reference to theatrical illusion, and huge scale which highlights the flat artificiality of its surface, underscore Johnson’s deflation of dramatic effects associated with the production of the sublime. Tom Dean’s Fear of Blue, on the other hand employs the familiar intimate scale of television to transport the viewer on a metaphoric journey across a vast landscape – a search for the almost infinite personal sensations, perceptions and associations-that the word “blue” describes. Traveling through Vancouver suburbs, along the Pacific coast and through the Prairies, the video records the ubiquitous blueness of the skies and lakes along the way. As seen through a car window, the tape offers up this chain of images as arbitrarily as any meandering road trip. Romantic conventions conjured up by shots of puffy clouds in pristine blue skies are undercut by the evidence of contemporary inhabitation, the occasional appearance of airplanes, telephone wires and construction cranes. Shots of the mountains are foregrounded by rows of residential housing, while seemingly motionless views of a quiet lake are subtly disturbed by the passing of a boat in the distance. Transcendent escapism associated with. idealized nature is punctured as the camera takes in the grand vista only to clumsily focus on some close-up detail before panning back to take in the larger scene once more. The soundtrack as well refuses the reverie traditional travelogues. It has a hallucinogenic interiority which abruptly shifts from the yodeling country blues of Hank Williams to a rambling voice over ruminating on “blue”. This speculative chain of free association catalogues the metaphoric and representational potential of the colour blue as “…insidious, invisible… emblematic of our conservatism…in league with the sun”. Dean demonstrates that technology and human experience, far from existing outside of nature, are fundamentally connected to it through the highly subjective capacities of memory, representation and language. Both Rae Johnson and Tom Dean carry on a relationship to the landscape that is, in a Canadian tradition, structured around identification and desire. But society’s altered relationship to the natural environment has destabilized such traditional conceptions of the landscape’s representation. Johnson’s numerous studies of a single view or Dean’s lengthy trip through a territory of signs prompt a reconsideration of the artist as an objective viewer, as well as, the idea of the landscape as a coherent and stable location. Project Room Series 6 is an investigation into the recent history of local art. It will examine certain works created in Toronto through the seventies and eighties towards a current rethinking of representation, materiality, identity and art’s social function. Venerable artist run gallery Mercer Union has spent the last season examining “the recent history of local art” with an innovative series of exhibits mounted in the gallery’s new Project Room, a walled off space built within Mercer’s main viewing area. The aims of this series have been varied and subtle, with retrospective shows alternating with new, sight specific installations. The Room’s final project delving into the past purports to look at landscape depictions created in Toronto through the 80s. But quite coincidentally this modest gathering of a 1982 video by Tom Dean and two 1989 pond scenes by Rae Johnson also contextualizes a turning point in one time Queen West bad-girl Johnson’s career. Johnson, who is best known as a co-founder of Toronto’s notorious, ground-breaking and now defunct ChromaZone group of artists, helped herald in the new wave of figurative painting in Canada with her bold, large-scale and stridently coloured scenes of seedy down town night life. But by the end of the decade the vibrant painter made the move up north to Flesherton, Ontario, a rural community where many of Toronto’s top artists have relocated. 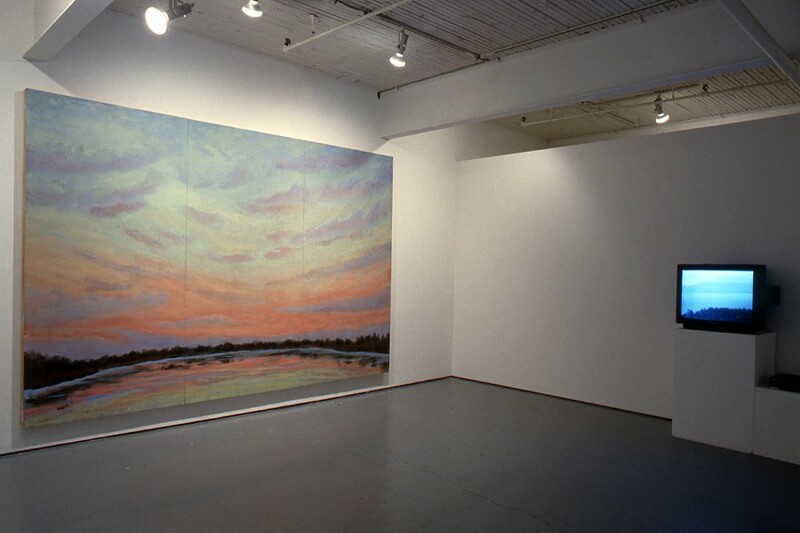 Her art underwent an almost immediate transformation, and her last show at the late Carmen Lamanna’s gallery featured a series of huge, almost hypnotic group of mahogany panels painted with lush clouds and sunsets reflected in a pond. It’s two of these that Mercer currently is showing. 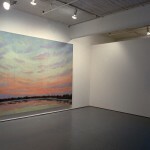 While they appear to be fine examples of the Canadian landscape tradition, these images actually idealize Johnson’s view from her studio, editing out the roadside signs and hydro wires bordering the highway that runs behind Johnson’s Flesherton pond. While the Mercer mini-show documents a historical moment, it’s a significant moment in terms of marking Johnson’s personal development into a relaxed, mature style that led to her getting the plum job of teaching OCA’s fall and winter terms last year in Florence. But despite her protests. Johnson is obviously thrilled by the achievement of her students, who took on the initiative to coordinate a show of their works at the Canadian Cultural Centre in Rome. The Carrier show, in fact, is a remount of the original Italian exhibition. It’s an accomplished exhibit of works by two dozen students, many of whom show some real promise. Highlights include Neena Arora’s Healing sculpture, in which Johnson notes gleefully “Neena manages to turn marble into styrofoam,” and Vlad Grospic’s The Passion Of Via Solferino, which is rich in references to England’s virtuoso portrait painter Francis Bacon and Vancouver/Berlin based bad-boy Richard Attilla Lukacs.